It’s springtime, which means that the best strawberries are in season! I was craving one of my favorite desserts, strawberry shortcake, which I have not eaten in a long time. To my husband, who grew up in New Jersey, strawberry shortcake means eating strawberries, whipped cream and angel food cake. To me, who grew up in California, it means eating strawberries, whipped cream and a sweet biscuit. My mother used to make the shortcake using Bisquick, which I don’t use, so I needed to find another recipe. My internet search led me to a very delicious Cook’s Illustrated recipe, Rich and Tender Shortcakes with Strawberries and Whipped Cream, published May 1, 1997. I didn’t make any changes to their recipe. Furthermore, I was able to use all organic ingredients, except for the salt and baking powder. The biscuit was tender on the inside and crispy on the outside with the right amount of buttery sweetness. Add rich whipped cream and juicy sweet strawberries and you have the perfect dessert! Best of all, my husband loved it! 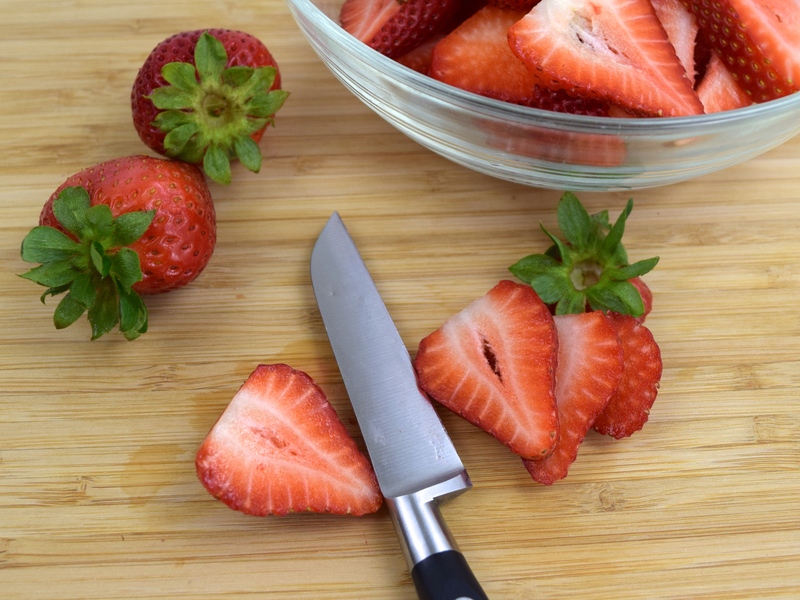 Prepare strawberries in advance by hulling, slicing and adding sugar. Sugar helps to bring out the juices of the strawberries, but I prefer to add a minimal amount. Set aside and refrigerate. Mix together flour, salt, baking powder and sugar in a large bowl. Using the large holes of a grater, grate the butter into dry ingredients. Toss the butter into the flour using a fork. With a pastry cutter, incorporate the butter into the flour, until the mixture is the size of peas. Mix beaten egg and half-and-half together and then add it to the flour mixture. Using a fork, mix until large clumps form. Then on a floured working surface, lightly knead dough, until it comes together. Pat dough into 9″ x 6″ rectangle, ¾” thick. 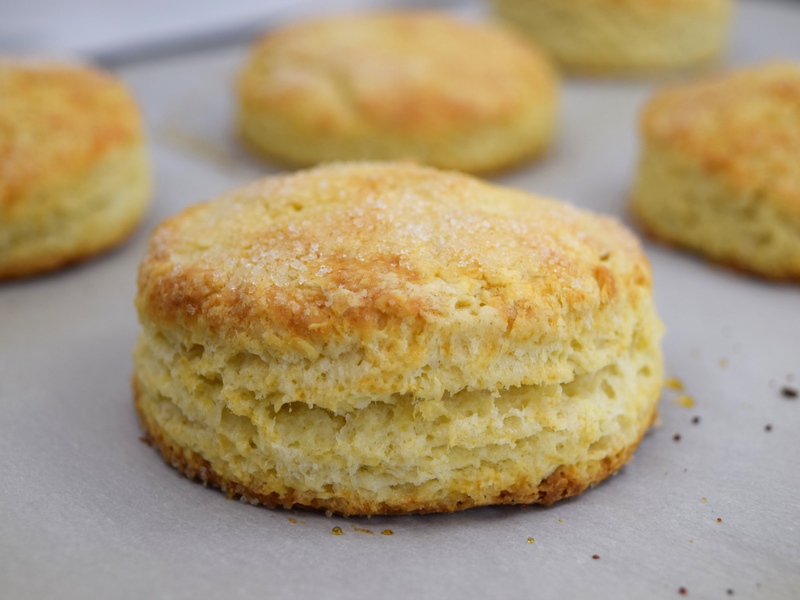 Using a floured 2¾” biscuit cutter, make 6 biscuits. Brush them lightly with egg white and sprinkle with sugar. Place them on a parchment lined baking sheet and put into oven on the middle rack. Bake for approximately 10 minutes, until golden brown. Cool for about 10 minutes. In a medium chilled glass bowl, add heavy cream, sugar and vanilla. Beat until you get soft peaks. 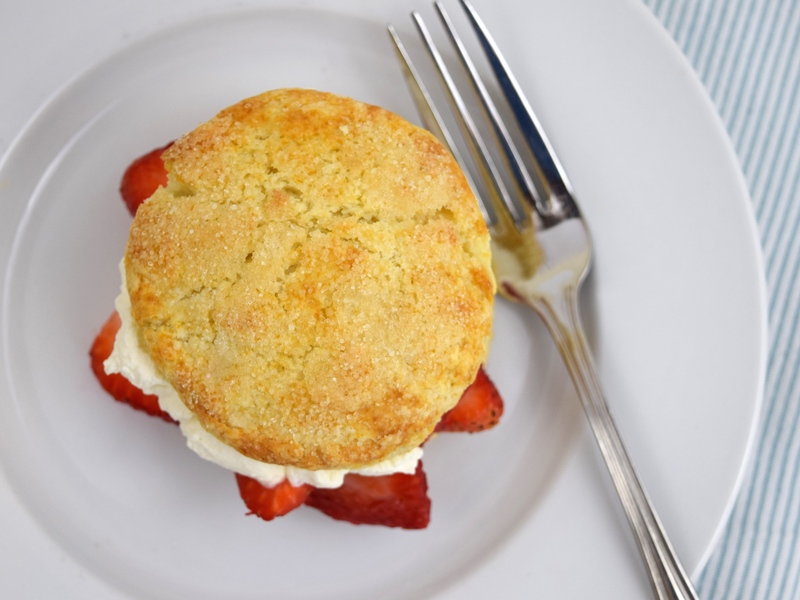 Cut biscuit in half, add strawberries and a dollop of whipped cream on the bottom half. Top with the other half. Repeat 5 more times. Serves 6. These look delicious, perfect way to celebrate the arrival of spring! Jess, the shortcake recipe was rather easy to make. The only thing that was somewhat tedious was grating the stick of butter, but it was worth! Thanks for taking the time to comment. Your shortcake looks gorgeous and just sings spring! I love cooks illustrated and everything they make. Thanks Julie! Yes, Cook’s Illustrated is a wonderful resource! Like your website!